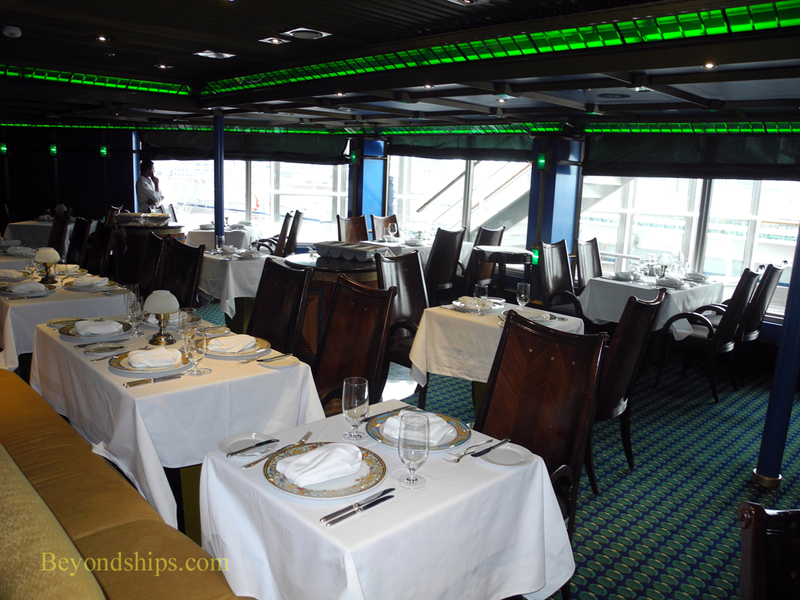 In 2010, I did a lengthy review of the Emerald Steakhouse on Carnival Glory (see review). In 2013, I returned to Carnival Glory and dined in the Emerald Steakhouse again. I was pleased to find that the experience was much the same as in 2010 and so what I wrote then still applies. The Emerald Steakhouse remains Carnival Glory's only true specialty restaurant. Located at the top of the ship, the horseshoe shaped room offers panoramic views that can be quite spectacular at sunset. The green and blue decor is restful but urban. With Frank Sinatra's greatest hits playing softly in the background, it can cast a romantic spell that recalls mid-20th century New York. The menu remains that of a sophisticated, up-market steakhouse. It is not gourmet French fine dining. Think high quality steaks and seafood cooked exactly as ordered. The sides such as the signature Yukon Gold Wasabi Mashed Potatoes have a broad appeal. Speaking of side dishes, this time I discovered the tasty sauteed mushrooms. And while peppercorn sauce is my usual favorite, the Bearnaise sauce with its mixture of creaminess and lemon was a pleasant surprise. The service at the Emerald Steakhouse remains friendly and attentive. I asked Hotel Director Alain Lopez to describe the Emerald Steakhouse's role on Carnival Glory. "We emphasize the quality of the meat, the quality of the lobster that we serve. We emphasize the service. We have changed the uniform. It is a bit more relaxed than it was before. Before we used to ask the guests to wear a jacket." "It was popular in the past and it remains very, very popular. The food and the service is impeccable. If you want something a bit more elegant, a bit more refined you come to the steakhouse. It is nice if you have something to celebrate, a special occasion. Or if you want to have a very romantic evening, you come to the steakhouse." Especially on short cruises, it is advisable to make a reservation prior to embarking. This can be done online. There is a $35 cover charge for dinner at the Emerald Steakhouse.